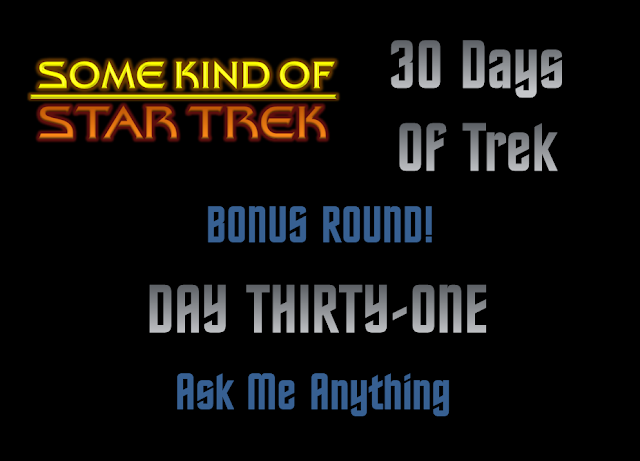 Some Kind of Star Trek: 30 Days of Trek - Bonus Round! As promised, here's my little added extra to round out October. I'll keep it simple today because I'm actually handing over control to you guys today, the readers! So first off, thanks to everyone who has even attempted a single question over the last month and to those of you that have managed to keep up with all 30, well done and thanks for coming along. I hope you've enjoyed it and maybe found out a couple of things about Star Trek too. I thought I was insane for attempting this but somehow it's worked. Which brings us to this Ask Me Anything. Here's how we're going to work this. In the comments section just post up your question and I'll answer it. I'm also opening this up to everyone who has followed the #30daysoftrek to answer the questions posted so you might get some interesting answers. 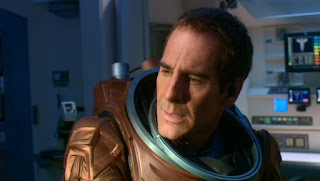 Normal service on Some Kind of Star Trek will be resumed this week. I have a chunk of reviews and other assorted bits coming up which I hope you will enjoy. Check back on all the previous questions HERE.